Known as the "Island of Spice", Grenada is a major producer of mace, cinnamon, ginger, cloves and, specially, nutmeg. 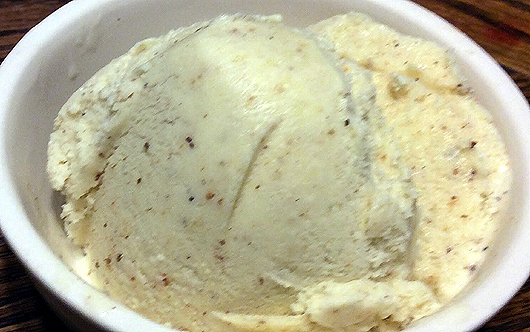 It's thus not surprising that Grenadians would make nutmeg ice cream. For lovers of nutmeg, this has to be a special treat. For me, it was boring. The ice cream tasted just like nutmeg. There was no subtlety, no variety of flavors from spoon to spoon, just nutmeg. Of course, I ate it by itself, it might have been better served with a cake or a pie. In a bowl, whisk together the eggs, sugar, nutmeg, vanilla extract and salt. Set aside. Put milk and cream in a medium size saucepan and heat over medium heat until the mixture almost comes to a boil. Turn off heat and whisk ½ cup of the milk mixture into the egg mixture. Now whisk the egg mixture into the milk mixture. Turn the heat back on and cook over medium-low heat, stirring constantly, until the mixture reaches 175F. Transfer the mixture into a metal bowl and place this in a bowl of ice water. Stir until it's cold. Freeze the mixture in an ice cream maker according to th emanufacturer's instructions.